Hedgehogs are mammals that have been around for millions of years. These animals naturally live through most of Africa and in southern Europe. They are primarily insectivores, but will eat a variety of different animal and plant matter when available. They are nocturnal and spend most of the day sleeping and become active at dusk. A hedgehog’s most distinctive trait are his quills. Quills are sharp hollow hairs that are used as a defense. 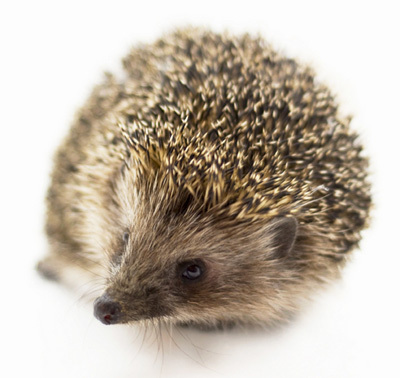 When threatened, a hedgehog is able to curl up into a ball with its quills extended. The quills usually have white tips with brown bands and act as camouflage. Other color variations can be brown, black, cream, gray, and even albino. The African pygmy hedgehog is the most common type sold as pets. It can grow to be around six to nine inches long. Four to six years is a normal life span, but a pet hedgehog can live up to ten years. It is a solitary animal and should live alone. A hedgehog is a very active animal. He will require a large cage even though he is small. Fortunately, there are many cages of adequate size available for reasonable prices. He will also need time outside of his cage to explore and run around. Since hedgehogs are nocturnal, they are best for people who are home in the evenings and at night. A hedgehog may not be a suitable pet for small children. Sometimes kids can be overzealous with their affection causing a hedgehog to become afraid and extend his quills. This could lead to injury of a child or pet. A hedgehog is fun to watch, quiet, not aggressive, and is fairly easy to care for. It is a clean animal and has very little smell. His food is easily attainable and inexpensive. A hedgehog can be a wonderful addition for someone who wants a unique and entertaining pet. All the items your need to care for a pet hedgehog. All the foods required for a healthy and nutritious diet. Everything your pet needs to have a fun and safe home. Some of the more common health issues that could affect your pet. How to handle your hedgehog, bath him, and trim his nails.